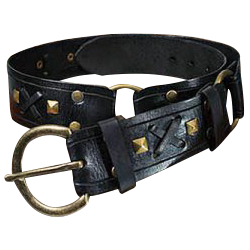 The intriguing and attractive Arthur Leather Belt is hand-crafted from 100% leather and features a number of intriguing designs that make it quite an impressive belt to look at, and of course, it is still a totally functional belt. This leather of this belt is entirely black and features several decorative designs, the upper and lower edge of the belt features embossed lines. Round studs are paired together along the length of the belt, broken up by square, pyramidal studs, as well as crossed leather laces which are threaded through the belt. The belt is also broken up into three distinct segments, which are attached to one another by metal rings. This belt is only available in black, but comes in several sizes, so order by waist-size to ensure an appropriate fit. Despite a decorative appearance, this buckle belt will still do everything a belt should. It will secure your trousers up, fasten a tunic to your waist, and hold up your belt-bags, sword frogs, and tankard straps. If you are looking for a stylish and decorative belt that still does everything a belt should, then look no further than the Arthur Leather Belt. It is an awesomely styled leather belt that is fit for a king.